Learn more about the Skizofriends Art Movement. Ketemu Project is a social art initiative by Indonesian artist Budi Agung Kuswara also known as Kabul and Singaporean artist Samantha Tio who also goes by the moniker Mintio. Not wanting their practice to be limited within the commercial art market, they kicked off Ketemu in 2011 to develop creative projects that involve and empower the local community while tackling social issues. 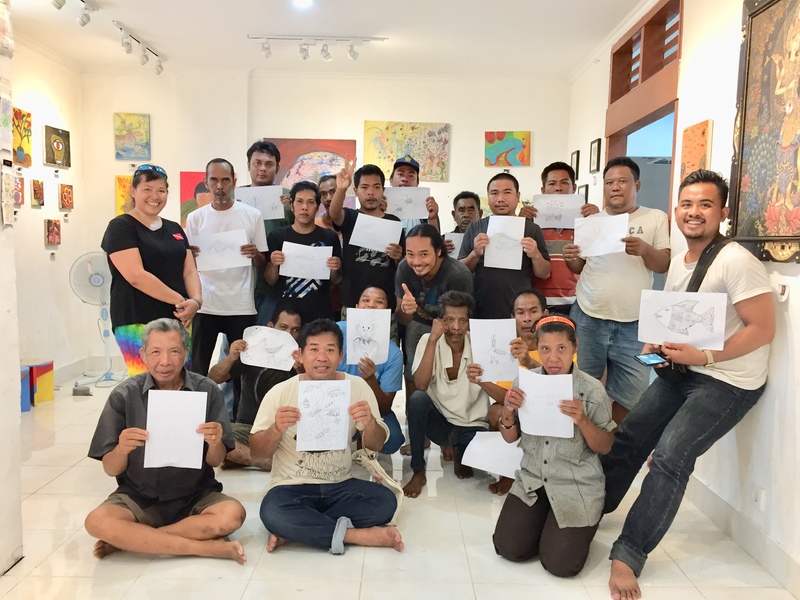 Skizofriends Art Movement is one of the projects that came out of Ketemu and has been recognised as Indonesia’s first psycho-social rehabilitation space. Since its launch, it has been applying art as a medium for mental wellness and expression, and challenging the stigma on schizophrenia. Kabul shares with B-Side the story behind Skizofriends Art Movement and its impact. It all started when Mintio and I had our first community art project “Malam dijari kita/ the wax on your fingers” in a Klaten village in Central Java. By working out of the studio and having direct interaction with the subject of our work, we experienced a very inclusive process of art making. Through the project, we learned that by removing ourselves as ‘studio artists’ and fully taking on the role of a facilitator on the field in the spirit of involvement and social responsibility, we are able to explore and unlock much more possibilities. It’s a methodology that surprised us, surfacing results that we never imagined. During the same time, I was actively consulting with Dr. Rai, a psychiatrist, for my research. I found it interesting that he gathered his patients living with schizophrenia for a weekly sharing session. It provided them with social support beyond medication. I was interested to learn more so with a colouring pen and paper I visited their homes and met their families for a few observations. To my surprise, they were incredibly artistic and had a unique way of thinking. It wasn’t even ‘out of the box’ thinking anymore, for them, the box never even existed in the first place. However, because of the stigma of schizophrenia, they have been unable to express themselves fully and many are lonely and jobless. This put quite a strain on their families also. This experience inspired me to approach Dr. Rai to partner on a project to conduct a weekly creative workshop at my studio for people living with schizophrenia. 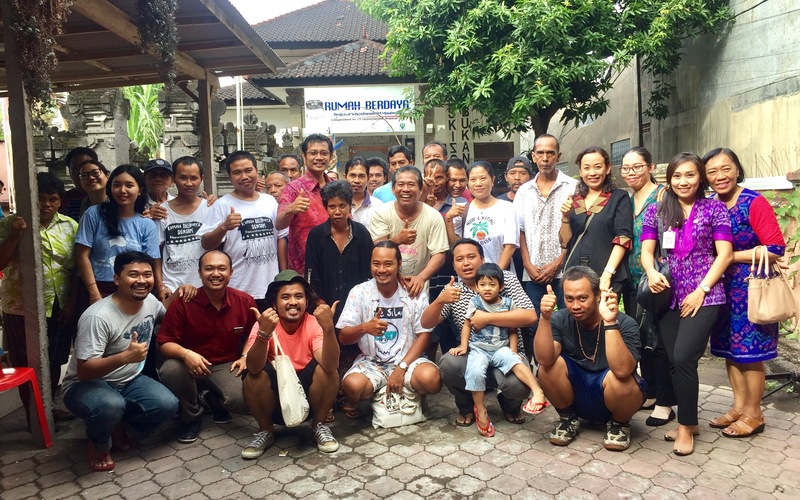 About 2 years into the program, Dr. Rai, another colleague from Denpasar health department and I proposed to the Mayor of Dendasar for the permission to use any abandoned buildings in the city as most of our members are from the area. We finally got a place and we named it Rumah Berdaya meaning House of Empowerment and it is now recognised as the first psycho-social rehabilitation centre in Bali and Indonesia that is based in society instead of a mental hospital. Through art as a tool for expression and empowerment, we’ve been working to challenge the stigma and reintegrate people with schizophrenia back to society. Art invokes in me a feeling of home. Yes! Knowledge isn’t simply information I have gathered. It’s also how I experience the information and how it becomes a part of my life experience. It is only then that I can truly declare that it has become my knowledge. My experience of Skizofriends Art Movement is one such process and it has become a fundamental aspect for the development of my current art work. In the first year, we focused on skill-based workshops because our seed funding would only support us for six months. So we created products like incense stick (used daily by Balinese) and T-shirts with their designs to sustain our operations. Not at this moment, but we are always open to new possibilities!